Mackenzie Foy is a model and American actress who became famous after her role of Renesmee Cullen in the last parts of the cult picture "The Twilight Saga". Since the early childhood, the girl got acquainted with the film industry. Today Foy is considered to be a promising actress who will brighten up the Hollywood. Mackenzie was born in Los Angeles. She began her career already in the childhood. The beauty of the girl admired her relatives and friends, and soon the representatives of the model business got interested in this girl. Her parents were persuaded and allowed their three-year-old daughter to take part in the photo shoot. The young model became the face of Guess Kids and Garnet Hill companies, and in future represented The Walt Disney Company and Mattel brands. The girl became a very demanded model. Well-known model agencies were trying to get her as their model. But being a teenager, Mackenzie suddenly got a desire to take a try in acting. Her parents again supported their daughter’s decision and were happy with her aspiration to move forward and to try something new. Foy has grown up together with her elder brother Bailey. Because of her busy shooting schedule, she couldn't get her secondary education at school; she studied sciences in the form of homeschooling. 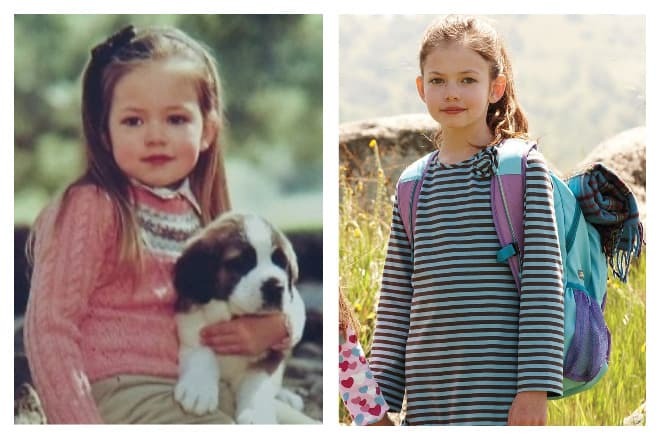 Mackenzie Foy debuted on television. The girl got a small role in the series "’Till Death". This sitcom about the routine of a married couple from Philadelphia gathered Brad Garrett, Joely Fischer, Eddie Thomas and other stars of TV screens. Before Foy gained the love of the audience, she had appeared in two series, including "Hawaii Five -0" where the creators of the cult vampire saga noticed her. In 2011 the fans of the American writer Stephenie Meyer rushed to the movie theaters. The director Bill Condon shot the first film from the last part of the novel "Twilight". In this fascinating melodrama "The Twilight Saga: Breaking Dawn" the girl received the role of the baby Renesmee Cullen in her childhood. Dozens of pretenders took part in the audition. But Mackenzie overshadowed all of them. People say that the authors of the project have seen the similarity between the appearance of the actors who became her parents in the movie. The audience liked the character with unusual abilities not less than the leading heroes – Renesmee’s parents - Bella Swan and handsome vampire Edward Cullen. Kristen Stewart and Robert Pattinson performed these roles. 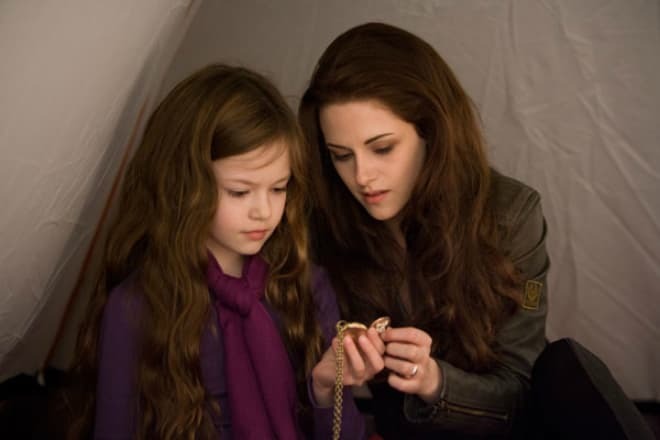 A year later Mackenzie Foy appeared in the second part of the movie "The Twilight Saga: Breaking Dawn". Christie Burke played the character of Renesmee in adolescence. 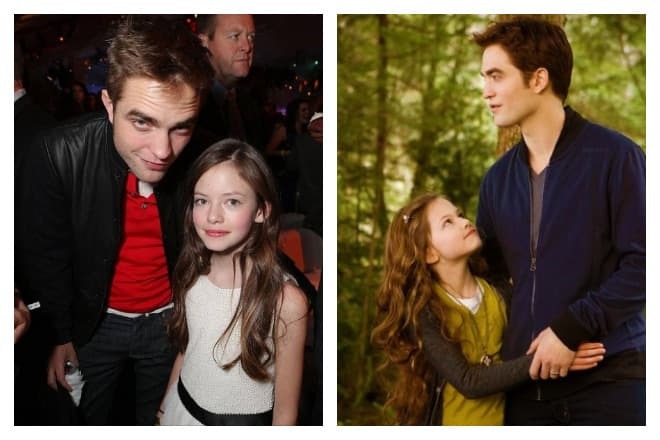 Mackenzie Foy and Robert Pattinson appeared together in the movie "The Twilight Saga"
The directors were pleased and satisfied with the young actress. The girl was very obedient, responded to any request without the hysterics and any whim. In addition to her natural appearance, Foy was perfect for such kind of work. She got offers to take part in the shootings one after another. "I can say, that this movie is frightening. Well, …it's frightening". Foy developed her acting talent more and more with the years. The critics and the audience, having watched the fantastic drama directed by Christopher Nolan "Interstellar", noted that Mackenzie Foy "has considerably grown". The girl received one of the leading roles – she transformed into the 10-year-old daughter Murphy of astronaut Cooper (Matthew McConaughey). Jessica Chastain played the grown-up girl, and Ellen Burstyn appeared as elderly Murphy. 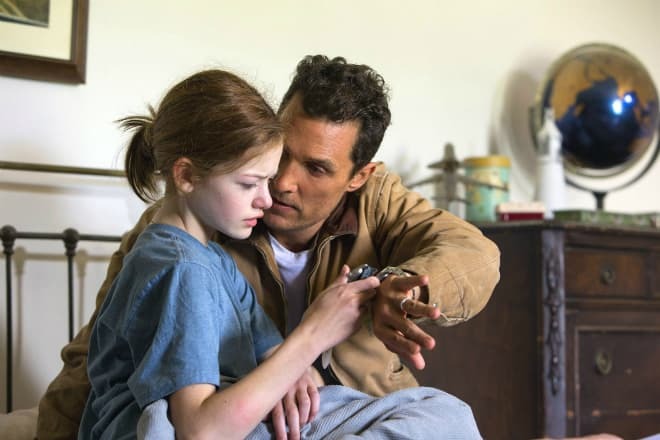 Mackenzie Foy and Matthew McConaughey in the movie "Interstellar"
The filmography of the actress isn't numerous yet, but Mackenzie already gained one award and five nominations. In her assets, she has Saturn award for her brilliant acting in this fantastic movie. But she also received the anti-award. Together with Taylor Lautner who played the character of Jacob Black in "The Twilight Saga", the actress got Golden Raspberry Awards. Their duet was called the worst actor's duet for their acting in the second part of " The Twilight Saga: Breaking Dawn". Mackenzie didn't limit her creative biography to the shootings in the movies. The girl with angelic look continued to work as a model, posed for advertising banners of children clothes, and in the spring of 2013, the star of "The Twilight Saga" appeared on the cover of "L'Officiel" magazine. One can only be envious of the energy of the actress. Alongside with other deals, Foy managed to voice over the animated characters. At present, the actress already voiced two personages in animated series. In the future, she is going to work in this sphere. Mackenzie worked on the voiceover of the character of Violet in the animated series "The Boxcar Children" and the girl in the French animated movie "The Little Prince" based on the legendary work written by Antoine de Saint-Exupéry. This fragile girl (her growth is 155 cm, and she weighs 45 kilos) is a Scorpio on her zodiac sign. She is fond of taekwondo; she discovers the knowledge of step and ballet at the choreographic studio. Moreover, Foy has some musical skills – she perfectly plays the concert grand. Try as it might, the press can't find the details of Mackenzie’s love affairs. Perhaps, the actress didn’t have relations because of her early age. At least, nobody noticed her in the company of the guys. Foy is not a fan of social networks though she has her page on Twitter and Instagram. She rarely publishes her photos. On her page, you can continuously see her four-feet favorite – a Rhodesian ridgeback by the nickname FayaFly. 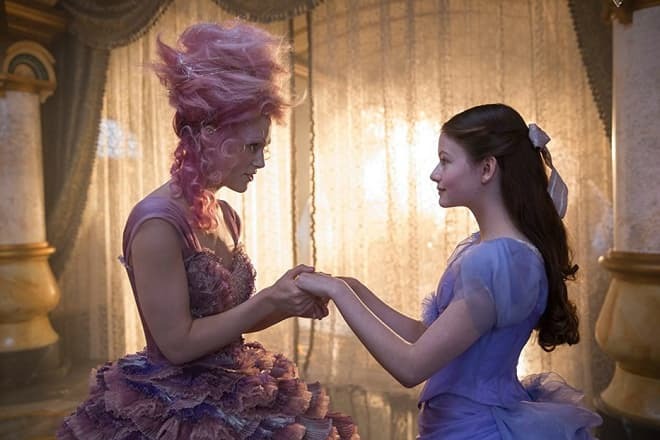 In 2016 the directors announced the cast of the forthcoming movie "The Nutcracker and Four Realms". 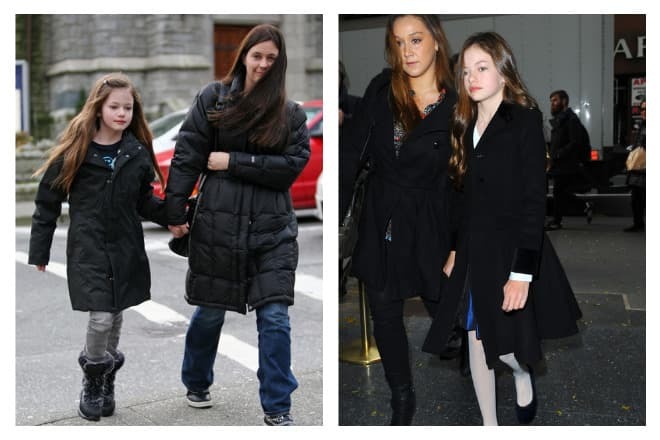 Mackenzie Foy got the leading role in this picture. The girl represented the character of Clara who decided to travel around four kingdoms. Mackenzie Foy and Keira Knightley in the movie "The Nutcracker and Four Realms"
The director Lasse Hallströmon gathered on the shooting stage the best actors of the Hollywood cinematography. He invited Keira Knightley, Helen Mirren, Morgan Freeman to take part in this adventure picture with fantasy elements shot by the work of Ernst Hoffmann. The premiere of this fairy tale will take place in autumn of 2018. 2009 - " ‘Till Death"
2011, 2012 - "The Twilight Saga: Breaking Dawn"
2013 - "Wish You Well"
2014 - "Black Eyed Dog"
2015 – "Jesse Stone: Lost in Paradise"
2018 - "The Nutcracker and the Four Realms"